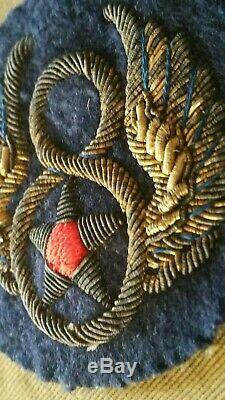 WW2 US 8th Army Air Force AAF Lot w/ Theater-Made Embroidered Bullion Insignia. Everything was removed by the family from a tailor-made Ike Jacket for. I had 3 of these embroidered'8th' insignia - this is the last. Scarce, you will be hard-pressed to find a similar example. The items in this lot include. Exquisite theater-made 8th AAF shoulder insignia (embroidered lighter bullion on felt) - likely hand made. Original lapel devices one 4-piece U. 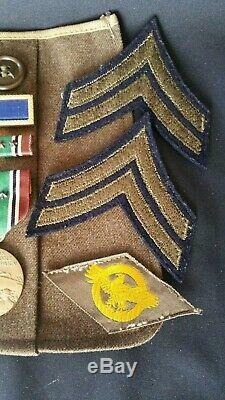 & one 3-piece AAF insignia w/ natural patina (no restoration). 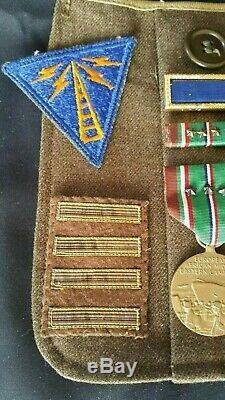 Original presidential unit citation & ETO ribbons (w/ campaign stars). 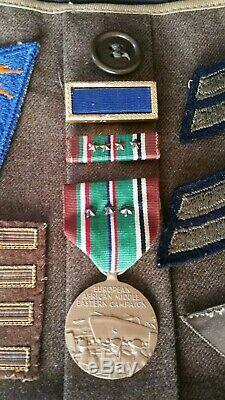 Original ETO medal (w/ campaign stars) mounted w/ ribbons on original Ike pocket. Original chevrons and ruptured duck. Original Army Air Corps communication specialist insignia. Original overseas service bars (2 years) - appear to be theater made. NOTE: Natural and available light used for used for photography. Items come from estate sales and auctions. Every attempt is made to describe them accurately and to the best of my abilities. The image(s) should be used for your final decision. The item "US MILITARIA WW2 US 8th Army Air Force AAF Lot with Theater-Made Bullion Insignia" is in sale since Thursday, March 28, 2019. This item is in the category "Collectibles\Militaria\WW II (1939-45)\Original Period Items\United States\Uniforms". The seller is "grex*" and is located in East Stroudsburg, Pennsylvania.